Yasmin Elhady is the daughter of Libyan and Egyptian immigrants, otherwise known as a North African Unicorn. She was born in Egypt and came to the United States at age 4, growing up in the deep South. That’s right, the place otherwise known as the most accepting part of the country. Yasmin is an attorney and relationship expert who enjoys sharing from her life in the form of storytelling and helping other’s find love. She received her undergraduate degrees from Emory University in Atlanta, Georgia in Neuroscience and Middle Eastern Studies. 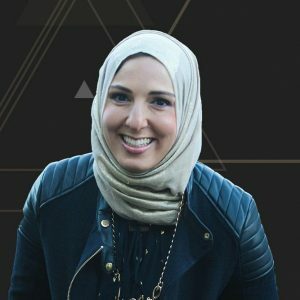 After completing a graduate fellowship at the American University in Cairo focusing on Arabic, she attended law school at the UCLA School of Law. There, Yasmin was the President of her law class, as well as President of the Muslim Law Students Association. She wrote onto the UCLA Law Review where she was a Comments Editor, and also served as the Chief Articles Editor for the UCLA Journal of Islamic & Near Eastern Law. Upon graduation, Yasmin was selected for the U.S. Department of Justice’s Attorney General’s Honors Program. She later attended Princeton’s Woodrow Wilson School, was named a John L. Weinberg ’47 Mid-Career Fellow in Public & International Affairs, and served as her Public Policy class’s student government representative. She then returned to federal service & is currently an attorney. Her roles as mother, daughter, wife, and sister help inform her perspective and relate to other people’s joy and pain with humor. Her alter ego is “Yasguru,” a hyper active relationship advisor with silly videos on YouTube.